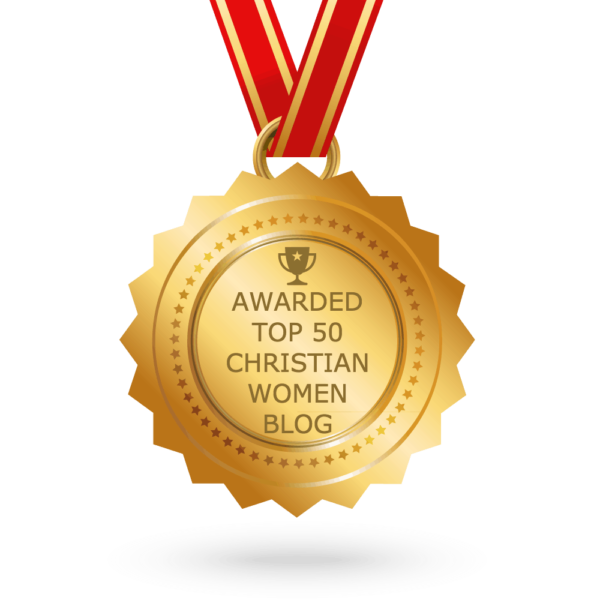 Encouraging women to face the challenges of life with the hope of Christ. Last week we had a special day in our home. Eight years ago today we walked into an orphanage in a tiny village in Bulgaria and walked out with our daughter forever in our arms. It’s a miraculous day. One that forever changed us as a family. Yet as much as we celebrate that day, it’s also a day marked with pain. I’ve written about it before – the fact that adoption is God’s beautiful way of making beauty come from ashes. Every adoption story begins in grief. And for anyone who has walked the pain of grief, you know that the pain of loss doesn’t magically disappear because of a new beautiful that enters your life. The loss is still there. It weaves its way throughout your life. It doesn’t take away from the new beautiful, instead it creates a unique poignancy to it. So, on this day, yes, we celebrate our beautiful daughter. But we grieve with her, too. Because her speech and ability to process and express herself is limited, we don’t know exactly what she is thinking. But she’s talked of a few memories that seem to hurt deeply as she cries. And then she acts out and pushes me away. Then, even though my mind understands the grief, my heart aches and my own tears fall. On days like today I think about the years of prayer before she came home. And I am reminded to never relent in those prayers because prayer changes things. It was as if He’d spoken to me. No, not that audible Morgan Freeman-as-God type of voice. But in a way that I felt the message to the core of my soul. It was a message that said I needed to pray for the hearts of my boys. Pray like crazy that they will love their sister well no matter what happens. At the time we didn’t even know who our daughter would be. We only knew that we were beginning to step into the waters of international adoption. It was one of the steps toward full surrender. Because I loved praying and knew the power of prayer, it wasn’t a huge step. Yet, still an act of obedience and trusting God’s lead. So, I prayed for the hearts of our boys. Prepare their hearts to love their someday sister well in all circumstances. Place a desire in them to be Godly role models for her. Instill gentleness within them for all matters pertaining to their sister. Extinguish any jealousy from rising up within them. Reveal Himself to them as the very Heart of adoption. Ignite a passion within them to forever advocate for adoption. Two years later, after great heartbreak and even greater joy, we brought their sister home. Our hearts were full and we knew we were finally the family God had designed long before time. 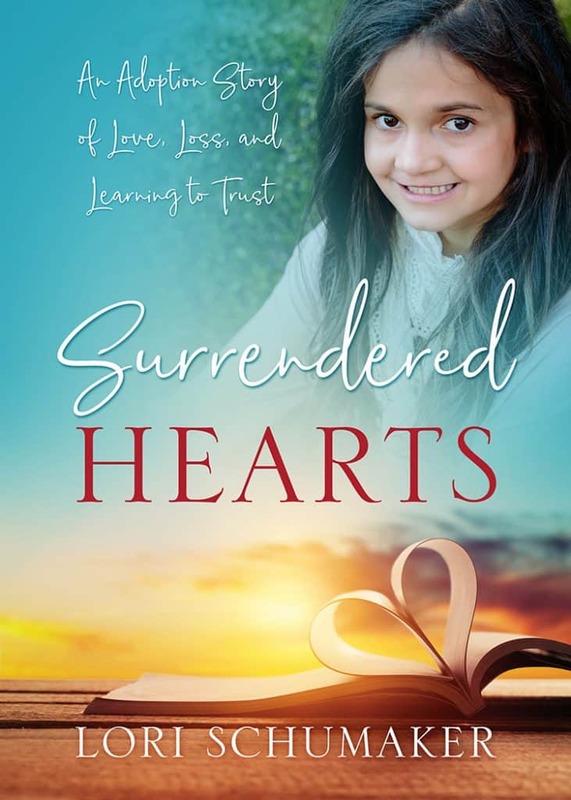 Yet, as I write about in my book, Surrendered Hearts: An Adoption Story of Love, Loss, and Learning to Trust, all adoption journeys weave both grief and joy into its very fabric. Just as our story to our daughter contained both grief and joy, our story on the other side of home held much of the same. As much as we prepared as a family and learned along the way that anything was possible, our vision of homecoming didn’t align with the reality we faced. Each of us entered with our unique hopes and dreams, but found an upside-down world greeting us. Broken lives and broken people had left their impact on our sweet girl. Not only were her physical health needs beyond what any of us knew about, but the enemy had worked heavily on her emotional health as well. We were in for a fight. A fight to save our little girl. One that meant almost daily drives into Phoenix Children’s Hospital to see specialists, therapists, and run more tests than I could keep track of. That lead to medications, treatment plans, and learning how to be a new kind of family. A family that could face the chains of discouragement, fear, and hopelessness but not succumb to them. Our world was turned upside down. Two boys ages nine and six had every right to be angry – to complain – to resent. But never once did their love waver or fade. Yes, they had tears and needed to talk. But it came from a place of grief and learning to embrace what was. To this very day, almost eight years after she has come home, their love for their sister continues to blow our family away. We’ve witnessed the undeniable hand of God in their lives and on their hearts. We’ve witnessed how prayer changes things. Our Selah knows she is loved. She knows she is a princess to these boys and looks to them like her knights in shining armor. Last fall on a hot Arizona evening, our high school celebrated homecoming. As a Junior in high school, one would think our son would want to join friends and do what regular teenagers do. However, instead, he and his 13-year-old brother brought their very excited little sister to the football game so she could enjoy the fun. For them, her joy is their joy. It rises above friends and parties and school activities. … Only the hand of God. I have to believe that voice I heard nearly 10 years ago telling me to pray for them to love their sister well was Him. What if I hadn’t listened? Or hadn’t prayed those prayers? What might our lives be like now? Would I have foregone the maturity of love that now lives in the hearts of these boys? Might our family have struggled even more? Friend, you may not be on an adoption journey like us. But chances are you are embarking on something – career change, relocation, school decision, relationship, or ministry. Maybe you are facing a new chapter in life that you never wanted to face such as divorce or loss. Whatever it is, take a moment to stop and listen. Read the Word of God, worship, praise, and friends, above all, pray. It is the most powerful thing you can do as you face your next journey. Have You Read Our Story of Hope? 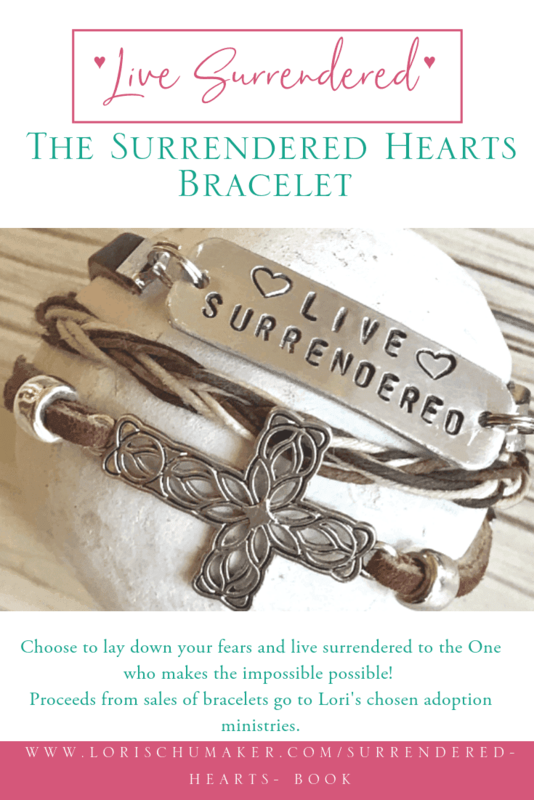 The Surrendered Hearts book is available on Amazon, Barnes and Noble, ChristianBook.com, and Redemption Press. Do You Want to Improve Your Prayer Life and Grow Spiritually? Get access to tools and resources to help you grow spiritually. Whether you are just learning to pray or you simply want to deepen your prayer life, you will find resources to help you grow. Subscribe and get access to the entire Library of Hope! My last words here are ones I have wrestled with for awhile now. You see, I love what the #MomentsofHope Link-Up has done over the years. I love those I have met and encouraging others to continue sharing words that point to Jesus. But friends, it seems I simply can’t keep all the blogging “balls” high enough in the air as I juggle them … right now. My intention has not only been to share hope with my readers. It has been to share hope with you, the writers, as you share your words with the world. So, when I can’t visit and promote those who link up here as much as I desire, my heart is burdened. I want to be one of your greatest cheerleaders and I just can’t do it well right now. But it’s not forever. My hope is that the #MomentsofHope Link-Up will return in the fall. I also have some projects to complete (including some new additions to the Library of Hope) and a few new speaking engagements to fit into my days. If you haven’t signed up on my email list, now would be a great time. I’ll be able to let you know what I’m working on that way! Also, you can find out what is going on through social media. You can “like” my pages directly from the sidebar or use these links. I love hearing from you! I certainly understand what you mean about keeping all the balls in the air. Blessings as you focus on what God is calling you to do. I look forward to hearing more about that in the future! I love that you are “A family that could face the chains of discouragement, fear, and hopelessness but not succumb to them.” Yes, prayer works. I loved reading about your boys in this posts. What a precious family you have and yes, prayer works. I completely understand. It sounds like you have a full schedule. I hope you will join us over on Grace & Truth and link-up your posts. I know our readers would love to see you there. Thank you for hosting this wonderful link-up. I have enjoyed it over the years and I have loved getting to know you through your writing. I will still be here when you post. Lori, I understand your struggle. I will miss linking up with you. I hope to join you again in the fall. By the way beautiful story, and you are exactly right prayer changes things! Thank you so much for the kind words, Angela. It’s so tough to let go of the things we love – even when we know it’s the best thing. I plan to be back, though, and look forward to connecting even more♥ Blessings to you! Lori, what a beautiful story. I love that you recorded these prayers and shared the impact you feel they have made over time. What joy it is to our kids loving each other well! Thanks, Kevin. I am reminded of God’s answering to that very prayer almost every day – Such a gift! Blessings to you! I hope you can return in the fall but I understand completely, and you are right about the prayers we pray, what if we had not? Grace. Thank you so much, Becky! I hope to be back as well! I’m praying so! Blessings to you! Thank you so much for visiting my website! My heart is to offer you encouragement and resources to move forward with hope and find freedom in Christ. Join the Searching for Moments community and receive private access to the Library of Hope. It's filled with resources to encourage and equip you to embrace your self-worth and lead a hope-filled life! Get Your Copy of Lori’s New Book Today! Lori Schumaker is a participant in the Amazon Services LLC Associates Program, an affiliate advertising program designed to provide a means for sites to earn fees by linking to Amazon.com and affiliated sites. Do you need an extra dose of hope? Join the Searching for Moments Community and get access to the Library of Hope. It's filled with resources to encourage your everyday life. Yes, I want to subscribe to your emails! Motherhood is a precious gift .But it doesn't come without challenges. Subscribe for extra encouragement and HOPE along the way! Your 5-Day Hope Toolkit includes a daily hope-filled scripture and prayer, an attitude inventory, a beautiful page of "I am" statements to combat negative thoughts, and my personal list of hope-filled resources. Yes, I want to sign up for your emails! It's time to let go of what the world says and embrace your true identity as a #ChosenandWorthy child of God! Subscribe and get all the resources you see here plus everything in the Library of Hope ... it's free! How could more hope help your day-to-day life? If this is content you could use more of in your life, subscribe to my email list below. You will receive consistent hope-filled content that will encourage and equip you to surrender, trust, and follow where God is calling you. All subscribers get full access to the resource-filled Library of Hope, too! Yes! I want to sign up for your emails! If this is content you could use more of in your life, subscribe to my email list below. You will receive consistent hope-filled content that will encourage and equip you to move from where you are to where you want to be in life. All subscribers get full access to the resource-filled Library of Hope, too! Do you need more hope in this season of hurt? Get this Journal & Growth Guide to walk you through 7 areas of healing from both rejection and betrayal. Plus, have full access to all resources in the Library of Hope!